First I loved this book!! It was a little slow going in the begining but as the book progressed I could not stop reading. Courtney has created a world where reapers are beasts like bears and wolves and they eat people to send them to the underworld. There are also reapers that come in human for called Vir I would say more but I don't want to spoil the book. The Characters of Ellie and Will are so strongly written. Ellie is a badass and Will fights right along with her. One thing I can say about this book was I was very happy there was no love triangle. There was another boy but Ellie's focus was always on Will. I found that refreshing since most books nowadays have a love triangle. The supporting characters were all very well written I loved Ellie's best friend Kate she was so supportive and caring even when Ellie's parents thought she was crazy. I would like to find out more about some of the other characters hopefully in the next book. 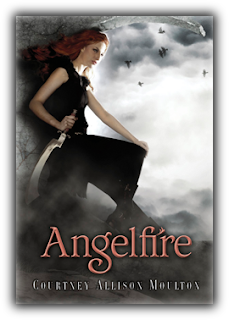 I was very lucky to recieve a copy of Angelfire from netgalley thank you so much! I can't wait to read Wings of the Wicked which comes out in 2012. Thank you Courtney for creating such a cool world.